Studying the Bible is a life-long adventure. Hebrews 4:12 reminds us, “For the word of God is alive and active. 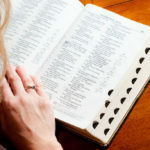 Sharper than any double-edged sword, it penetrates even to dividing soul and spirit, joints and marrow; it judges the thoughts and attitudes of the heart.” You should never get tired of studying God’s Word, and you should be a life-long student of not just learning, but applying God’s Word to your daily life. If you’re looking for some different methods or types of studies you can pursue on your own, consider these six options as you dig into Scripture—either for your personal use or for teaching others. 1. Chapter summary. The Bible wasn’t originally written with chapters and verses, but many people choose to read one or two chapters each day. You might choose one book of the Bible and study one chapter at a time. If you like this method of study, consider reading a chapter in its entirety. Look for repetition of words, theological themes, names of people mentioned and their significance, cross-references, and choosing one “big” lesson or application. 2. Topical study. Select a subject and then find every verse you can find on the topic. For instance, if you want to examine the topic of faith, keep a list of passages that define or demonstrate faith. Have an exhaustive concordance nearby to help you identify key passages. Examine the original language and look for similarities as well as differences. 3. Devotional study. A practical and personal way to study God’s Word, select a passage and meditate on its truths. The Bible is practical, so look for key themes or applications you can incorporate in your daily life. For instance, if you read a passage on the dangers of gossip, consider if you need to confess that sin or what steps you will incorporate in your life to avoid it. 4. Word study. Similar to a topical study, a word study focuses on a word, but closely examines its origins and language. Just as the word “love” has many different meanings in Greek, a word study examines all of those definitions and how the author used them. 5. Character study. This is actually one of my personal favorite methods of study, but it isn’t a study for a quick 15-minute devotional time. Instead, you want to find out everything you can about one person in Scripture. Becoming acquainted with the people of the Bible will give you insight into how God used them both in history and in His story. 6. Verse-by-verse analysis. This is similar to a chapter summary method, but takes a deeper dive into each verse in a passage. If you choose this method, look for ways to paraphrase each verse, ask questions about each verse and discover insights from them. I think the best way to tackle this approach is to have a lined notebook where you can write out each verse and ask the same questions about each one as you work through a bigger passage. Want more? Check out the new CSB Study Bible for Women. Not only will you have God’s Word, you will have built-in devotions and study helps that make God’s Word come alive in your daily reading. You’ll find a complete look at the various options online, or you can find this new resource at your nearby LifeWay Christian Resources store. If you’d like more information on this subject, check out Rick Warren’s Bible Study Methods.